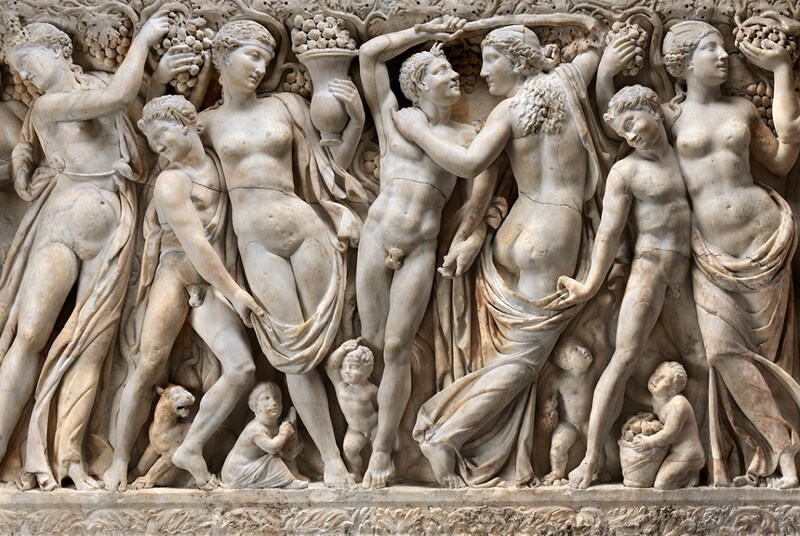 A daring new exhibition, Life, Death & Revelry, takes a close look at one of the Isabella Stewart Gardner Museum’s most treasured works, the Farnese Sarcophagus, widely considered the most important ancient Roman sarcophagus in America. This immersive installation explores the piece’s history and features a new artwork inspired by the Sarcophagus by Artists-in-Residence Paul Kaiser and Marc Downie of OpenEndedGroup. “This exhibition traces this artwork’s journey from ancient Rome to nineteenth-century New England, and allows us to place it in conversation with a contemporary new media artwork,” says Dr. Christina Nielsen, the William and Lia Poorvu Curator of the Collection. 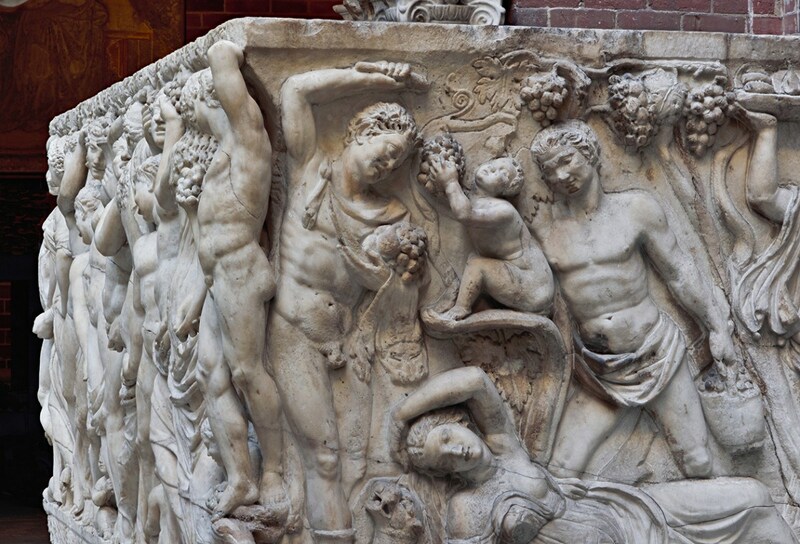 Roman, Severan, Farnese Sarcophagus with Revelers Gathering Grapes: Front (detail), about 225 AD. Marble, 163.2 x 62.23 x 26.67 cm. 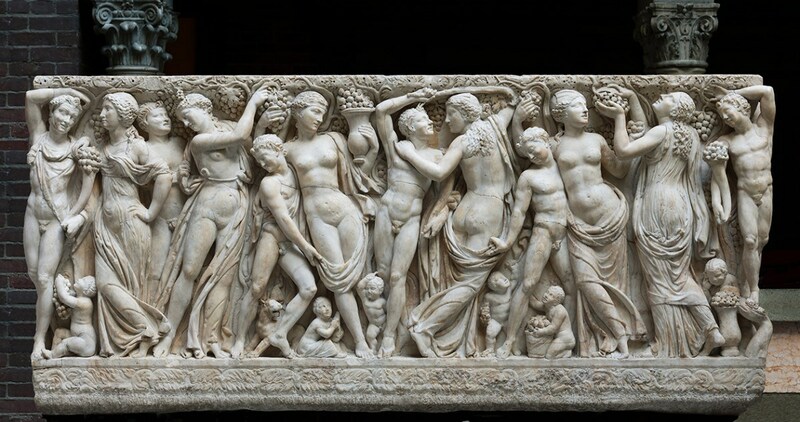 Roman, Severan, Farnese Sarcophagus with Revelers Gathering Grapes: Left, about 225 AD. 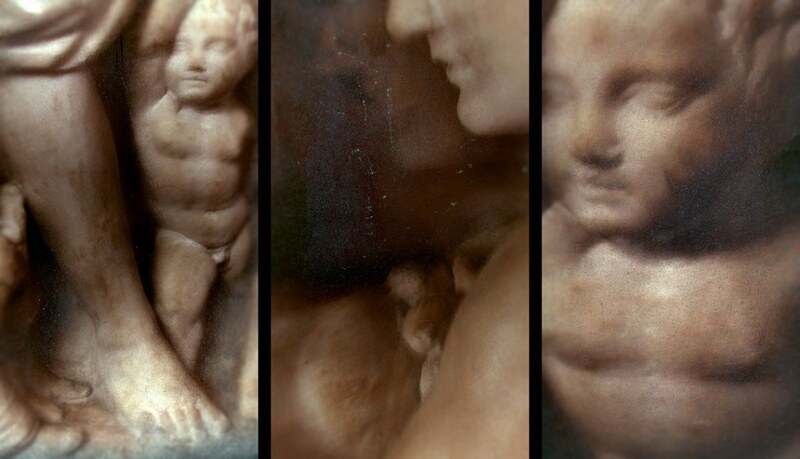 Marble, 163.2 x 62.23 x 26.67 cm. Roman, Severan, Farnese Sarcophagus with Revelers Gathering Grapes (detail), about 225 AD. Marble, 163.2 x 62.23 x 26.67 cm. 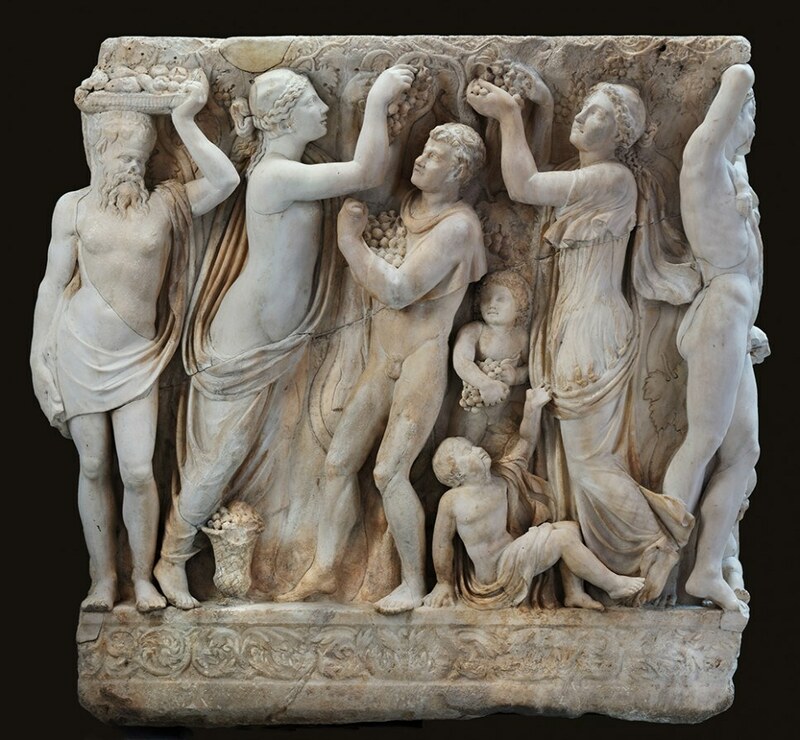 Roman, Severan, Farnese Sarcophagus with Revelers Gathering Grapes: Front, about 225 AD. 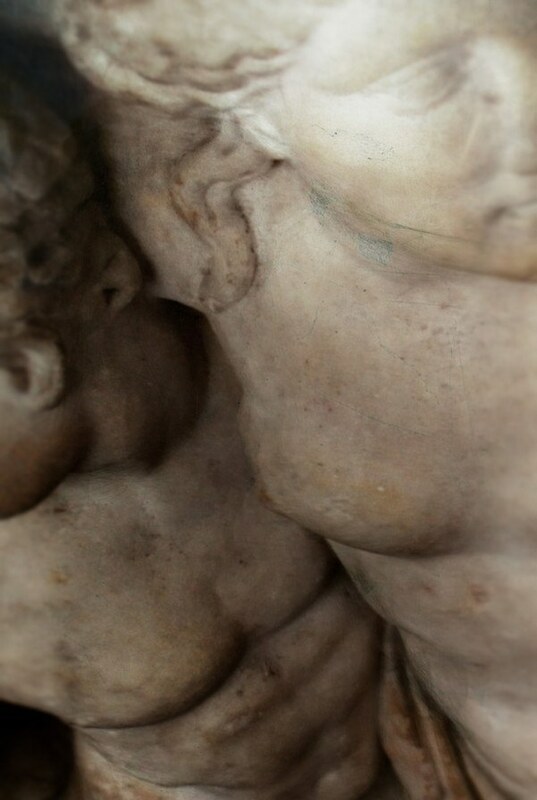 Marble, 163.2 x 62.23 x 26.67 cm. For Life, Death & Revelry, the monumental 7,500-pound object is being carefully restored and rigorously studied by the Museum’s conservation team and will be temporarily moved from its usual place between columns in the Palace courtyard into Hostetter Gallery for the first time in more than 100 years, so that it can be viewed from all four sides. 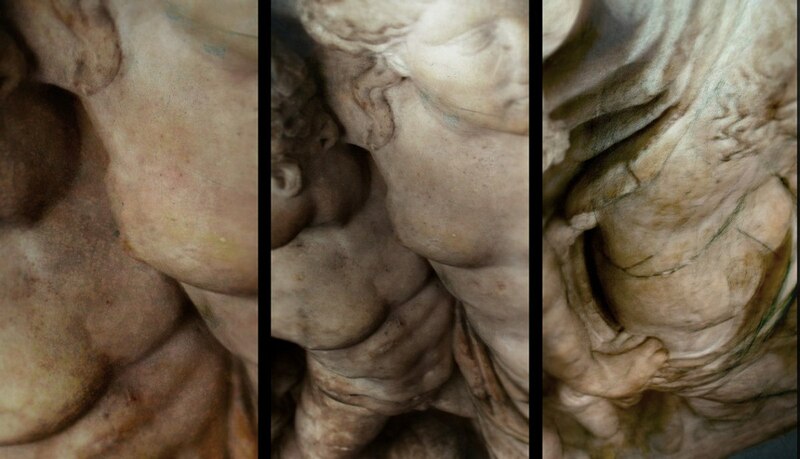 Over a period of many months and repeated residencies at the Gardner, artists Kaiser and Downie carried out an intensive photographic study of the sarcophagus, which they analyzed using their own custom-designed software platform, transforming the data into a 3D projection installation called “Maenads & Satyrs.” It combines non-photorealistic 3D renderings, body movements by motion-capture, and the autonomy of artworks directed or assisted by artificial intelligence. Kaiser and Downie often use film, motion capture, photography, drawing, music, and architecture for their work. The soundtrack is a specially commissioned recording of cellist Yeesun Kim performing Kaija Saariaho’s musical composition “Petals” for solo cello and electronics. Visitors will be able to find their own personal meaning in this timeless work as part of the exhibition’s multi-disciplinary programming of dance, music, and other performances that draw on the object’s universal themes of life, death, and merriment. Life, Death & Revelry opens June 14 in the Hostetter Gallery. For more information on this exhibition, visit gardnermuseum.org.